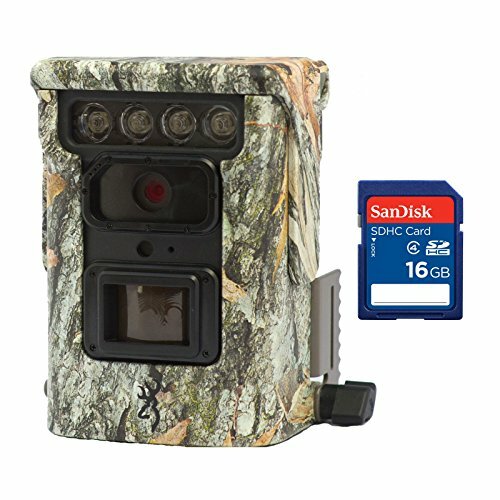 Invest in an extremely stealthy game camera that takes your off-season scouting to the next level and helps you find that monster buck - the Browning Trail Cameras Defender 850 20MP Bluetooth Game Camera. This camera features an 80-foot detection range, adjustable, invisible no-glow infrared illumination, and a speedy 0.4-second trigger speed so you end up with more of those crisp, clear images of wildlife, day or night. Timelapse Plus enables timelapse mode during the day and trail cam mode at night, while Smart IR video detection optimizes your full HD video capture. With the Browning Trail Cameras mobile app, you can use this cam's WiFi and Bluetooth to download and view media straight from your phone. This package also includes a 16 GB memory card from SanDisk. The memory card easily slides into your game camera and can be transferred to any SD compatible devices. For your peace of mind, it features a write-protect program that prevents accidental deletion of your media. This SD card holds up to 6,160 photos on a 10 MP camera or 240 minutes of video when recording at 9 mbps.